I talk to a lot of my moving clients every week, and let me tell you, there ain’t no business like the moving business. As I’ve written about before, movers live and die based on their ability to generate quality moving leads. In that original article about how to get more moving leads, I focused on more traditional sources of moving leads, like Google AdWords, Bing, referrals, and a few moving lead providers. In this article we’re going to expand beyond those fundamental moving lead sources and look at some unconventional moving ideas that, while unconventional, can still bring in tons of leads and moving clients each month. Anyone can focus on the basic moving lead sources. And your company should be generating leads from all those sources and you should be mastering those approaches. But if you want to go beyond being a basic moving company, if you want to become a unicorn and dominate your local market for decades, then you also need to invest in and master the following unconventional lead sources. I wish you luck. Wrapped trucks provide phone calls from people who need a mover and see your trucks. And the phone calls you get will be very easy to close and turn into jobs because of the mental model of social proof. The person calling has seen your truck out in the field in action and knows that other people in their area are using your company. That’s tremendous social proof, and it’ll make these callers very likely to use your company. And the trucks are also great for branding when your guys are driving to and from jobs. Wrapping trucks is something every serious moving company should do, and it can seriously bring in the leads. Try to work out a parking arrangement where your trucks can be seen 24/7, either at your location, or try to work out a deal with a nearby business who’s got excess parking lot space that you can park your trucks in. The best moving companies run their moving business out of a highly visible location. Your office can actually be the biggest driver of leads. I know a moving company that has a great little office building on a very busy highway. Everyone driving on this stretch of highway, in both directions, can’t miss this moving company. And thousands of people drive by every single day. The office building has great signage, and the wrapped trucks are always out front in the parking lot and are easily visible from the highway. Think about it, this company gets their brand, trucks, and signage seen everyday by literally tens of thousands of people. And many of those people drive by their office twice every single day. That kind of brand awareness, mindshare, and comfortability can’t really even be bought with any other form of marketing. People drive by their location hundreds of times for years and then when they need a mover, who do you think they’re going to call and do business with? It’s not even close. Building a brand from your location visibility is one of the most under talked about and under rated form of moving company lead generation. And not only is having a great location great for lead generation, the money you spend on this kind of lead generation is not an expense. It’s actually an investment because you’re buying a property, improving it, and you’ll have a sellable or rentable asset on your hands if you ever expand to a new location, move, or even if you go out of business this office can generate income for you by selling it or renting it out. And you can always borrow against the building when interest rates are low or when you’re tight on cash. Having a great office and place to park your moving trucks that gets seen by thousands of people every day can be your best source of leads and can literally keep a moving company in business for decades. And not only can a great location be your biggest source of leads, the leads you get from people seeing your location are basically free because instead of spending money on these leads, all you’re doing is investing in an asset that pays for itself. Every moving company should be focused on getting a great location to run their business out of. Putting your face and company on YouTube is all about growing awareness and gaining trust. Moving companies are mysterious entities to most people. Most people don’t know anyone in the moving business, they’ve never met a moving company owner, and the majority of moving company websites looks shady and don’t show pictures of real people and places. Given all the mystery, most people are wary of moving companies. But you can break through this wariness by putting your face and company out there on YouTube. People trust what they can see, and people seeing and hearing from you on YouTube will instantly garner you more trust than all the other movers in town get. Make videos about the moving industry, make videos about running a business, make videos interviewing customers about what they value in a moving company, and make videos about your life, your office, and the people who work at your company. You don’t have to put out videos every day or even every week. Just try and put out a short, interesting video every month or so. And then you can share you videos on your social media and website. These videos will help customers find you and get comfortable with the idea of hiring your moving company. One of the worst pain points in hiring a moving company is not knowing who you’re hiring and what the process will look like. Running a YouTube channel is an easy way to eliminate that pain point, get more leads, and book more jobs. I talk more about how a YouTube channel can help your moving company in this video. It might be surprising to see an AdWords manager laser-focused on search engine moving lead generation recommending getting your moving company listed on Angie’s List, but from a moving customer perspective, I can tell you that people are indeed using Angie’s List to research and select moving companies. For me, and probably for many others, Google is the first place I go to when I need a moving company. I search something like “movers near me” or “Oklahoma City moving companies” and then I create a short list of moving companies that look decent. Then, before I call in, I do additional research on the movers I find from Google and I check out their websites, their Facebook pages, and yes, I go onto Angie’s List and check out their profiles and reputations on Angie’s List. Angie’s List has recently made some parts of it’s service free for anyone to use, and they are all over TV running a huge advertising campaign to bring in new users. Lots of people like myself use the free part of Angie’s List to research companies after we initially find them on Google. Therefore, having a profile and good reviews on Angie’s List will help you seal the deal and close new customers that initially find you from other sources like AdWords and organic traffic. I recommend that all moving companies get listed on Angie’s List and start trying to get good reviews on there. It can help grow your overall reputation online and close more of the leads you get from other sources. I talk more about this strategy below. The Nextdoor app and website is a social network for neighbors, and it is really popular among homeowners. From my experience, it seems like millions and millions of people are active on this social network. On this app, neighbors communicate with each other about day to day neighborhood topics, like missing pets, criminal activity, and importantly for you, service company recommendations. When someone needs a moving company, pest control company, fence company, etc. they go on Nextdoor and ask their neighbors for recommendations. These types of neighbor recommendations are the most effective source of moving leads you could ever get. There is literally no source of new business more powerful or effective than someone asking their neighbors for a recommendation and then multiple neighbors recommending your company. It’s doesn’t get any better than that. Once someone recommends your company on Nextdoor, I believe you have the ability to respond to the recommendation. I believe you can also interact with people on Nextdoor when they mention your company. Every moving company should claim their listing on Nextdoor and start interacting with customers and potential customers on there. Nextdoor is a gold mine source of the hottest kind of moving leads (word of mouth recommendations), and every moving company should be active on there. Every moving company wants more moves, and they especially want more moves on large houses. Developing relationships with multiple homeowner associations in your area is your golden ticket to getting more large home moves. Neighborhoods are always having people move in and out, and many neighborhoods in your city are governed by homeowner associations (HOAs). These HOAs want to be able to recommend service companies, including movers, to their current and new members. And you can be their go-to moving company. These relationships can bring in a ton of quality moves every month, and I go more in-depth in the following video. One of the biggest determinants of success in business is going with, and benefiting from, the demographic trends. If you can provide the right services or products to people at the right time, you can really benefit from demographic tailwinds. And one demographic trend in the United States as I write this is that there are millions of baby boomers who will be moving into retirement homes over the next twenty years. And often times, when a baby boomer moves into a retirement home, a moving company will be needed to a) move some of their items to the nursing home and b) move the rest of their items either into storage or to one of their adult children’s’ homes. Moves into a nursing home are always emotional and can often times even be traumatic. The person moving into the nursing home is not only giving up their independent way of life that they’ve enjoyed for the last fifty years, they are also facing the end of their life and often times this move happens after the death of a spouse. And in addition to that, not all nursing home moves are fully desired or accepted by the person being moved and sometimes the elderly person being moved has lost some mental capacities and can be very upset and irritable and not understand why they’re being moved. It’s tough stuff. And these tough, emotional moves require a professional moving company that is experienced in nursing home moves. Often times the adult children coordinating the move will be from out of town and will ask the nursing home if they have a moving company that they recommend. You can be that moving company. Add a service page to your website about nursing home moves, brand your company as nursing home move specialists, and develop relationships with all the nursing homes in your city and become the go-to nursing home mover in your city. The trend is your friend in this kind of move. 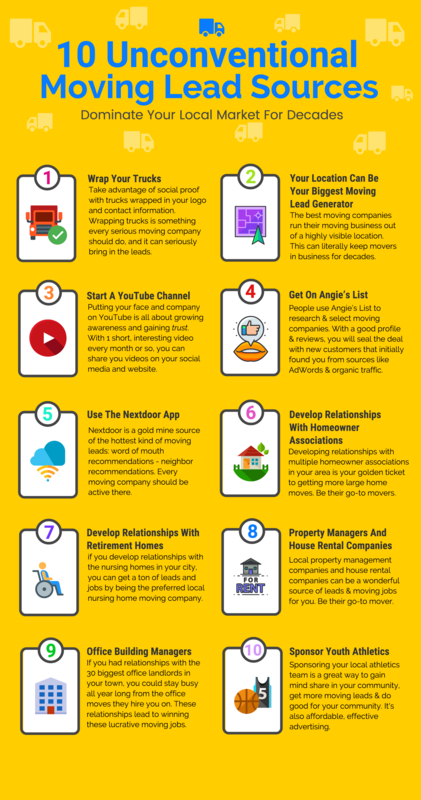 Demographics dictate that many baby boomers will be moving into nursing homes over the next twenty years, and if you develop relationships with the nursing homes in your city, you can get a ton of leads and jobs by being the preferred local nursing home moving company. Local property management companies and house rental companies can be a wonderful source of leads and moving jobs for you. These companies manage tons of apartment units and houses for their own holdings and also for other real estate owners. People are constantly moving in and out of apartments and rental houses, and these management companies can recommend you as their preferred mover to their tenants whenever they need a move. You can also come in handy whenever they have an eviction and need a professional and dependable go-to eviction moving company to work with. If I owned a moving company I would google “property management companies + whatever my city was” and make relationships with the biggest property management companies in town. These guys can provide a consistent source of moves, they need a go-to mover to recommend to their tenants, and there’s no reason you can’t be that go-to mover for them. Get on the phone, get out there, and start making these relationships. In the past I’ve talked about developing relationships with realtors through their realtor associations to get more residential moving jobs. We’ll, this ain’t rocket science. You can do the same thing in the commercial moving industry to get more office and commercial moving jobs. If you had to pinpoint who the one type of person is who could hook you up with tons of office moving jobs, who would it be? Obviously, it is commercial building landlords. If you had relationships with the 30 biggest office landlords in your town, you could stay busy all year long from the office moves they hire you on. Office buildings are constantly having tenants come and go, and on almost every single one of these entries and exits a mover is needed. And some of these jobs are terribly complex (for example, moving two floors worth of office furniture from the 20th floor downtown to a fourth floor suburban office building an hour away). These are not the types of jobs where the company or building manager just Googles “office movers” and hires the first person they talk to. Instead, these jobs require the right mover who can provide this unique moving service. And it’s relationships that lead to winning these moving jobs. If you provide great office moving services, then you could make these office building managers’ lives a lot easier by being their trusted, go-to office moving service. Every time they have a tenant company moving in or out they’d say don’t worry about it, I know a great office moving company, call these guys… and you’d get the job. Figure out who these office building managers are, figure out where they network, and get in front of them and develop relationships with them. They’ll have a go-to office mover to work with and their lives will be easier, and you’ll have a steady stream of big office moving jobs and you’ll be rich. Believe it or not, I was quite the athlete before I sat around all day on the computer managing AdWords campaigns for moving companies around the world. I lifted, I ran, I trained. I was an athlete. During high school I would run around the track almost every single day. And in our high school football field and track area we had multiple banner advertisements for local companies that pitched in and helped out our school. These local companies sponsored our athletic teams. This kind of advertising might be among the most effective and affordable forms of advertising out there. Every week, families from the school come and watch sporting events and every week they’ll see your banner ads. And many families have multiple kids at the school and they’ll be in and out of the school’s fields and gyms for nearly a decade. And every time they’re there, they’ll see your advertisements. This kind of advertising is a great way to gain mind share in your local community. There are also linking and PR possibilities when your sponsor a school’s athletic programs. This kind of marketing can bring in leads for years and years, and it’s affordable too. Sponsoring your local school’s athletic teams is a great way to get more moving leads and also to do good for your community.